Americans are all giddy about the drop in gas prices because they can’t see economic logic beyond the shadow of its immediate effect on their wallets. Little do they know that much of the nearly 1.2 quadrillion dollars of dodgy derivatives, the liability for which Citigroup masterfully managed to dump on American taxpayers and depositors recently, are riding on high oil prices, which have tanked and look as though they will remain that way for the foreseeable future. 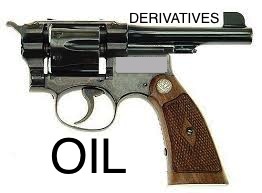 It’s almost certain that oil derivatives are soon to follow. Americans are oil-wise and dollar-foolish. For the few nickels they save at the gas tank, today, and the petty pleasure they derive from gloating over Russia’s economic pain, Americans stand to lose hundreds of trillions, from their bank accounts, investments, and tax revenue, tomorrow. It is just this unparalleled brilliance that has gotten Americans where they are now – up a creek, without a paddle, and blissfully headed down the drain. Moreover, as Dr. Roberts so astutely points out, Russia’s economy is far better off than America’s and anyone who thinks otherwise is living in neo-liberal la-la land. If Russia were to wake up today and take serious measures to protect itself and its domestic economy, it will bring the whole western financial establishment to heel at the alter of reality. So, the US and its crazy neo-con central bankers better put down that gun, before they shoot themselves and their countrymen in the head.